In these activities, students practice adding, subtracting, multiplying, and dividing in scientific notation. Practice includes problems where both decimals and scientific notation are used and scientific notation generated by technology. These notes and practice worksheets are differentiated based on some common needs found in the middle school math classroom. Modifications are considered for both struggling learners and high flyers. Traditional Notes – These are basic skeletal notes. Students fill in the examples with you and do the “try” problems independently. Teacher Notes – These are completely filled in for teacher reference. These notes are also great for students who have been absent. Advanced Practice – Perfect challenge for your high flyers! Many problems overlap with Basic Practice, but this worksheet skips some of the basic problems and replaces them with more advanced practice. Basic Practice – The majority of your students will complete this on-level assignment. Modified Practice – Great option for students requiring a modified amount of homework per an IEP or 504. 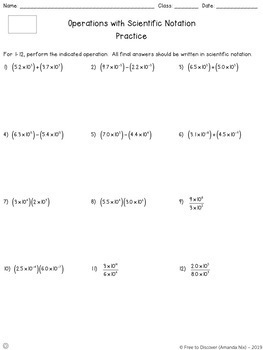 This is a cut down version of the Basic Practice assignment (one page only). NOTE: The different forms are denoted by a discrete symbol in the bottom left corner of each page. 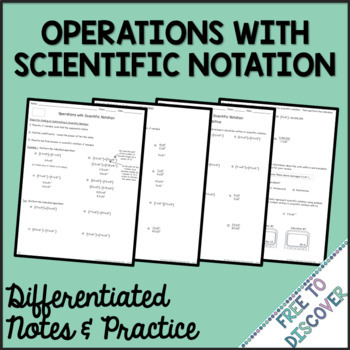 Scoop up the 8th Grade Math Differentiated Notes and Practice Bundle here. This resource is included in my 8th Grade Math MEGA (Growing) Bundle. The purchase of this product entitles a single user to reproduce the resource for classroom use only. Discounted additional licenses can be purchased if you wish to share with other teachers. The product is for educational use only. The product may not be used for commercial purposes or resold in any form. It cannot be uploaded to the Internet, including school websites.